Last night I decided to ignore the mess in my kitchen and to cook instead, meaning I added a few more bowls, knives and pans to the already overfilled sink. Yes, I know, gross! But sometimes I just want to ignore the dishes, make a fabulous dinner and then go dancing. The dishes are awaiting me tonight. 1. In a sauce pan melt 1 teaspoon of butter (reserve the rest for later). Saute garlic and onions in the butter until they are soft (do not brown too much!). 2. Add lemon juice (but first zest the lemon!!! ), the remainder of the butter and red pepper flakes. Lower the heat and let it hang out until the shrimp are ready. 3. In a separate pan heat the vegetable oil and saute the shrimp 1 minute on each side. Be very careful not to over-cook the shrimp. 4. 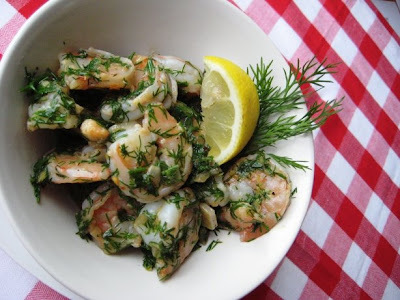 Add the shrimp to the lemony butter sauce and then add lemon zest and dill, making it lemony dill sauce. Adjust for seasonings with salt and pepper and serve immediately! Those shrimp are gorgeous! I would love this. what a fabulous idea! I LOVE dill too. This would work great with salmon. And the presentation is fantastic. This is really beautiful looking. That sauce is a standout. 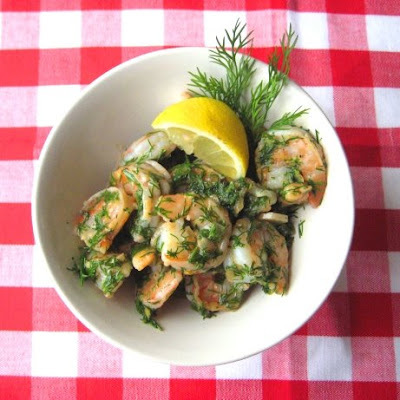 One question...does the garlic overpower the dill or is the dill primarily for color? 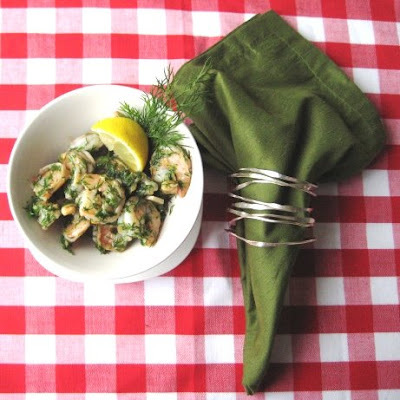 Dill sounds like perfect for seafood. Good flavoring olga! This looks fabulous and will certainly be on my agenda to make for dinner soon! Thanks for the tasty temptation! That sounds so fresh and delicious! This is one fine healthy & refreshing dish! MMMMM...with a good glass of white Sauvignon wine,...yummie! This looks really good. I wish there's dill at the market here. I guess i need to grow one myself. 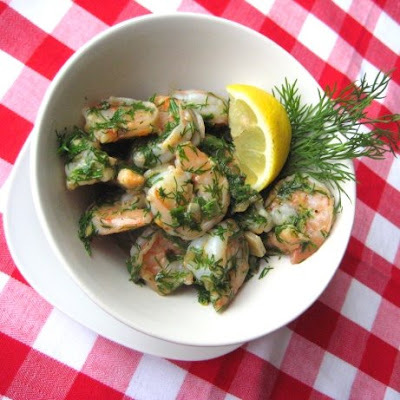 Lemon and dill pair so well with shrimp. Delicious! 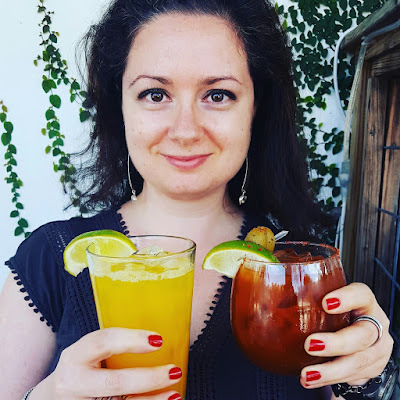 Wonderful flavours and they look so refreshing! I love shrimp in any way, shape or form. This looks like a lovely summer evening dish. Getting some dill for another dish this weekend so will have to pick up extra. Pretty photos! Love the abundance of dill! That shrimp looks good! I really like the sound of the lemon dill sauce!